Vietnam became a member of the TRIPS agreement on January 11th, 2007. Vietnam has a commendable intellectual property (IP) framework which includes several multilateral agreements and other relevant bilateral trade agreements. Having regard to the pace and growth of local and global economy, Vietnam enacted the Law on Intellectual Property Rights in 2005. The law provides protection to major IP rights in Vietnam: industrial property rights which include Patents, Design and Trade Marks; Copyright and rights in plant varieties. In addition to Intellectual Property Law of 2005, there exist other laws that govern other issues related to IPR, such as the 2004 Law on Competition and the 2005 Civil Code, along with precedents, circulars and notifications by respective authorities guiding IPR implementation in Vietnam. Description of sample in order to clarify its elements and meaning. 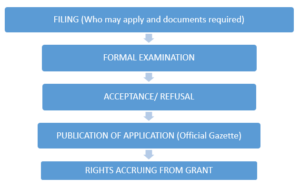 Where two or more applications are filed by several people to register the marks identical with or confusingly similar to each other, in respect of identical or similar goods or services, protection may only be granted to the valid application with the earliest date of priority or filing date among the applications that satisfy all the requirements. Additional fee for each product/service in excess of six: 30 thousand VND. Fee for publication of application, including application for amendment, supplement, separation, assignment (each application): 120 VND. Charge for substantive examination of application (for each group of six products/services) – without information searching charge: 300 thousand VND. The registration of marks shall be valid up to 10 years from the date of filing. Their validity commences on the date of grant of protection. It can be renewed indefinitely for consecutive terms of 10 years. Importing goods or services bearing the protected mark. The use of a trade name means the conduct of any acts for commercial purposes by using it to name oneself in business activities, expressing it in transaction documents, shop-signs, products, goods, and packages of goods and means of service and advertisements. Fee for granting a Certificate for trademark registration: 120 thousand VND. Trademark is any sign used to distinguish goods or services of different organizations and individuals. Trade name is a designation of an organization or individual used in business to distinguish the business entity bearing such designation from other business entities acting in the same field and area of business. The area of business stipulated in this paragraph shall be the geographical area where business entity has business partners, clients or reputation. PART III of the law provides industrial property rights. Capable of distinguishing goods or services of the mark owner from those of others. The most important characteristic of a mark is its distinctiveness or uniqueness. The IP law of Vietnam has one whole Article dedicated to the meaning of the term, and its limitations. Since the exceptions are clearly stated, no chance is left to vagueness or ambiguity. n) Signs identical with or insignificantly different from another person’s industrial design having been protected on the basis of an industrial design registration application with filing date or priority date earlier than those of the mark registration application. Not to be identical with or confusingly similar to another’s mark or a geographical indication having been protected before the date it is used.